I pump vitamins as if my life depended on it. My diet consists of mostly salad with tons of good-for-you veggies and smoothies with some lean proteins thrown in. I haven’t gotten sick in eons. And yet, when it really counted and I needed to attend a blogger conference I had been looking forward to for what seems like forever, I got the worst cold I’ve had in years. The fam and I arrived in Orlando on the Sunday before BlogHer17. We rented a cabin in Orlando, where many of our dearest friends from Nomadic Homeschoolers were hanging out, so that we could spend some quality time with our peeps before the conference. We had a great time catching up, enjoying coffee talk every morning and just being around each other. The Thursday morning of the conference kick-off, I woke up feeling pretty ragged. My throat ached, my tonsils were swollen and my muscles ached. I knew I was in for it. But I pushed on. There was no way I was going to miss out on this. Thanks to a career in online marketing that spans 15+ years, I’m an old hat at the conference game, even though I was a newbie at this one. This means that I went to registration early and beat the lines. Later I met with Jeannine from Affiliate Window, who I’ve known for years but never really “met”. We talked about some of the great stuff happening at AW and discussed working together. By the time I was done with that meeting, I was feeling very congested and having a hard time hearing people, but I pushed on and went to the opening keynote. 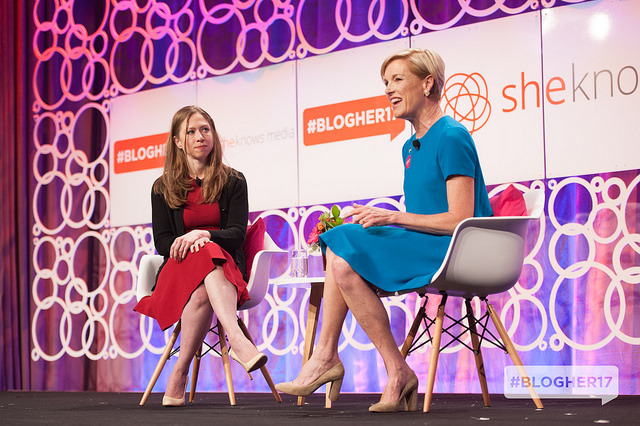 There was no way I was going to miss seeing the conversation between Chelsea Clinton and Planned Parenthood President Cecile Richards. After that I was able to see Margaret Cho, one of my all time favorite comedians, and all was well in my world. I made it through the opening keynote and was so glad that I had. Next up was the Evening at the Expo. I went in for five minutes tops. Honestly, I should have known better. I usually don’t go into the expo part of a conference until either the very end or when everyone is off to the sessions. Since this was my first blogger conference, I was excited to meet the sponsors and see what they had to offer bloggers. Like I said, five minutes and I was out. More on the sponsors in a later post. While I was walking down the hall I bumped into Lorraine Ladish, Founder of the Bilingual community VivaFifty and someone I’ve been following for quite a while. Never-mind that I called her by the wrong name when I introduced myself. I have the fever to thank for that one. Or at least, I can thank the fever for something to blame. I love reading about the authentic life she has carved out for herself. She was very forthcoming about her struggles and successes and where she is with her journey as a creator and influencer. Lorraine was speaking with Vanessa Mota who blogs over at Smart Little Cookie and was a Voices of the Year (VOTY) Honoree. She brought her adorable kiddos who looked like they were having a blast. Next up was my Latina Blogger Meetup at 8 PM. 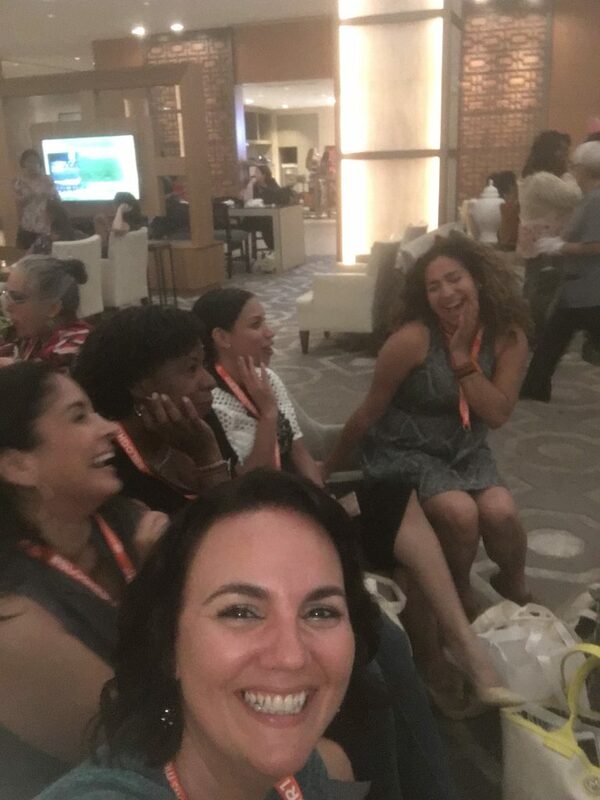 I wanted to connect with other Latina bloggers, so I created a meetup and was thrilled to learn that we had about 35 people say they would swing by and another 40-ish who were a “maybe”. I ordered a few apps and waited at the Myth Bar in the Hilton Bonnet Creek, where the conference was being held. They started to trickle in. First it was the pretty and sparkly Youtuber named Xenia Zee of Chef Zee Cooks who showed up with her mom. She is a chef who is half Cuban and Half Dominican. What an exciting mix of Island culinary delights she must whip up! We talked about the amazing dishes she creates and shares on her channel and her recent trip to Cuba. Her mom was not a fan of the trip as her daughter got caught in a hurricane. It was nice to see their dynamic, and even though I’m not a fan of cooking, I’m planning on trying her Guava and Cheese Pastelitos recipe. Next up was Mercedes Diane Griffin Forbes of DGSpeaks, a delightful Afro Latina with Colombian roots. She is a 40-something Latina like me and she proceeded to school me on Colombia and Providencia, the island where the dominant language is Creole English and the population is mostly of African descent. The Latino experience and history is so incredibly diverse that things like this always inspire me to constantly seek out our history and learn learn learn. Next to show up was Joy, a Guatemalan-American who blogs about her backpacking travels on Part Time Exploradora. She and I shared a lot of techie and marketing biz talk and I see quite a few things on the horizon with her. I definitely liked her zest and how much she questions things. 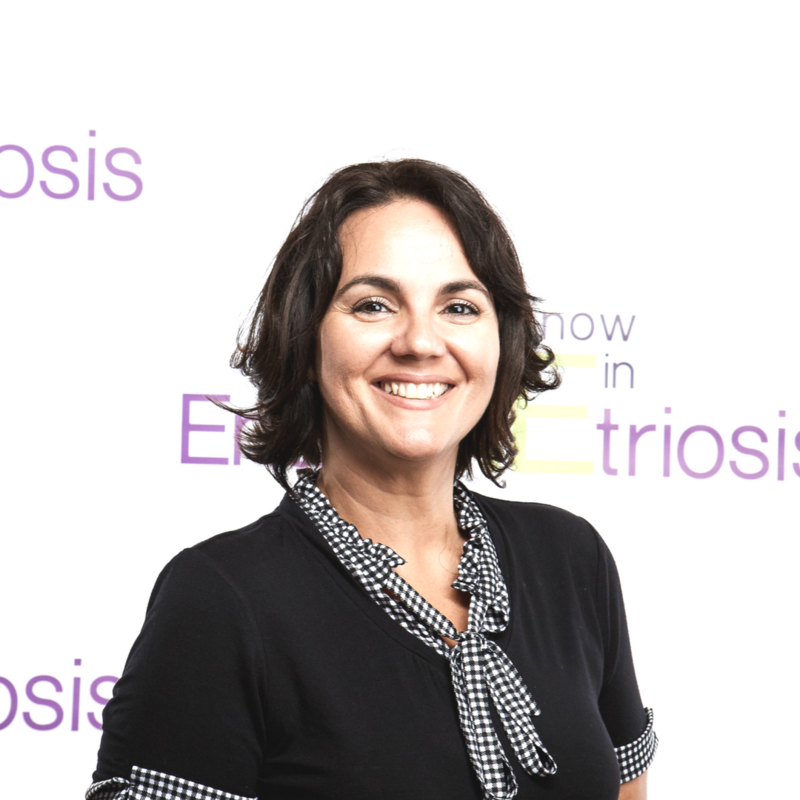 I also had a chance to speak with Nicola Rios Nogales of I Speak Mom where she shares her own stories of motherhood and those of other moms. I enjoyed hearing her speak passionately about being a mom and her mission to help other moms be their best and care for themselves. Here’s something I learned. When you are hanging with a bunch of bloggers, you are basically in the company of selfie professionals. When I laughed and explained to the puzzled group what my aim was, they simply shrugged it off and proceeded to pose for the “candid” version for me to re-take the photo. I was truly in the presence of selfie greatness. One of the ladies I had a chance to get to know was Taína Coté of Teach With Love where she sells products in order to raise funds that help minority high school students thrive and achieve their dreams. I really loved listening to her stories of the kids she works with and the hopes she has for them. About 30 minutes later I looked at my phone wondering where the rest of the ladies who RSVPd were and was met with several messages to the tune of “where are you?”. I responded and a group of rowdy laughing mujeres showed up to join us exclaiming that they had been searching for me for what seemed like forever. In the group were Melanie Edwards an award winning blogger at Modern Mami who was also presenting at a session. I loved Melanie’s confidence and wit. Excited to hang out at #blogher17 with #modernmami local contributors @vthrifty and @ricardo_j_e! Then there was Meryland Cuevas-Canela, who is a talk show host and producer of En Vivo Con Meryland. Her energy was wonderful, and I truly wish there was some way I could have siphoned off some of it for myself that night. There were so many ladies that I didn’t get a chance to chat with because I had to beg off by 10 PM when I just couldn’t even speak any more. Milly Diaz of La Opinion de Milly was one of these. I was really hoping to spend some time chatting with her, but at least we met in person. Cuando criamos hijos en un país que no es nuestro país de origen puede ser un poquito complicado. Gracias a @latinaboomermom por esta guía práctica de cómo criar niños bilingües. On the second day of the conference, I arrived just in time for the lunch keynote where I got to see Serena Williams speak. She was chock full of inspiration which I desperately needed to hear to push myself through the next few hours. I ran into Diana Rodriguez who is a vegan food expert and blogger at Recetas Latinas Veganas in the bathroom. We had been communicating on Facebook and I was looking forward to meeting her as well. I’m not sure if the sounds I made were coherent, but she kissed and hugged me even though I warned her about my illness. I hope she didn’t get sick! I remembered that there was a woman with this fabulous eye makeup and striking grey hair that I KNEW was Latina and I also felt that I knew her from somewhere. I kept seeing her and I couldn’t quite place her. Mind you, the usual speed with which I could process thoughts was just not present. I looked at the meetup rsvps on my phone and realized it was Sonia Guerra of Bohemian Babushka whom I had been online friends with for some time. When it dawned on me, I flagged her down during lunch and said my hellos. I wanted to plant a big wet one on her, but I didn’t want to spread the love (err germs). So I gave her a wave and promised to reconnect later in the conference. I went to back to the expo, had my meetings over the next couple of hours and hobbled out in a feverish haze. I arrived at my cabin soon after and passed out after a swig of Nyquil. I slept from 6 in the evening to noon the next day and missed the third and final day of BlogHer. 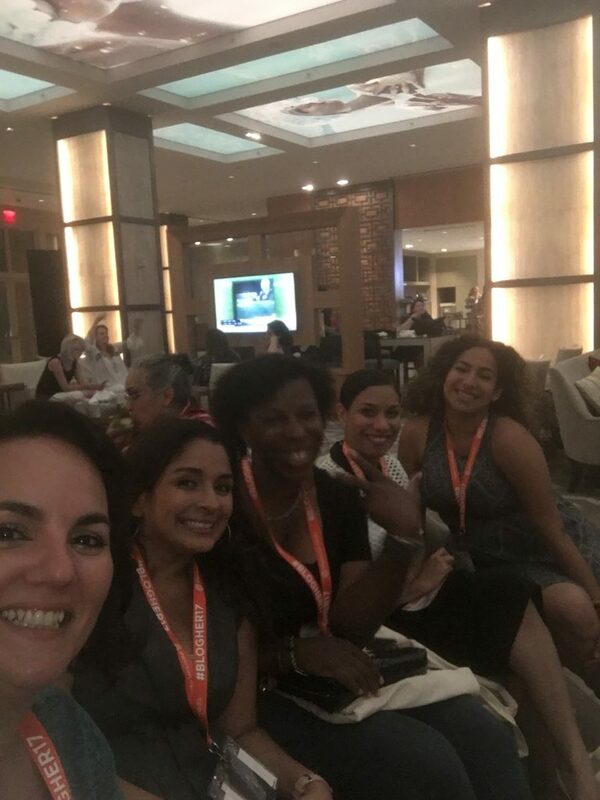 I was upset, but I was also so thankful that I had the opportunity to meet these awesome ladies and make connections as well as checked off my meetings. Yes! So glad to have met you even if briefly. I have never been to a blogger conference before. Sharing your experience is super enlightening! I was also there. I tripped on Thursday night and turned my ankle so I missed a lot of it also. Oh no, I hope you’re on the mend! I have bever been to a blogger conference (not sure we even have them in greece) but it sure is a fantastic way to meet new people ans iteract with other bloggers! Lucky you! What a great way to meet others. I’m sorry you weren’t feeling well but it looks as though you had a lot of fun! One day I’ll be able to attend one of the conferences myself. Maybe al the excitement caught up with you and that’s why you got a cold? 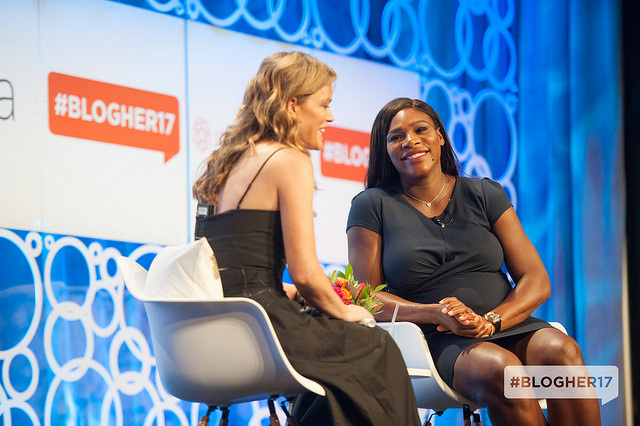 I used to always get sick when it was a big event lol BlogHer 2018 is my goal for next year. Awesome! It’s a privilege to meet so many amazing latina bloggers! It’s too bad you felt sick during the convention. I try to drink warm lemon water every day and it’s really helped me to avoid colds. I always find it amazing to be with likeminded people. Everytime I would attend events for bloggers, it gives me a feeling of belongingness. I love to socialized with my fellow bloggers and meet new ones because I learn a lot from them. I decided not to attend this year, but after reading your post, i think it is a fabulous idea. I absolutely love your experiences and you really gave me some inspiration to continue this blogging business! Sounds like you had an awesome time! I’ve been hearing a LOT about this event. Perhaps I should consider attending. This looks like so much fun! I am a newbie blogger, but this is so inspiring! Loved seeing the diversity of the Latina culture. Being half Mexican (and often mistaken for other ethnicities), I really love seeing how different the backgrounds are but also the togetherness of a common platform. Beautiful! I love this kind of event! Wish we have this event here in Manila. This is huge! 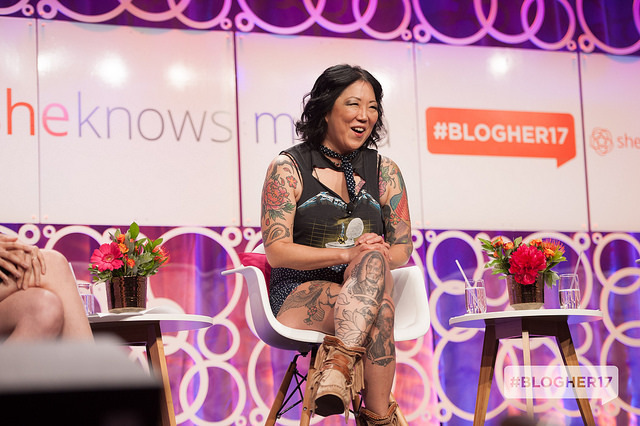 Hope you learned a lot from Margaret Cho, i love her. This so cool! I want to go to a blogger conference (event) just not sure where to or how to find them.